Human peripheral blood lymphocytes stained with Multi-Colour Human CD45RA/CD45RO/CD3/CD4 flow kit (4C002). 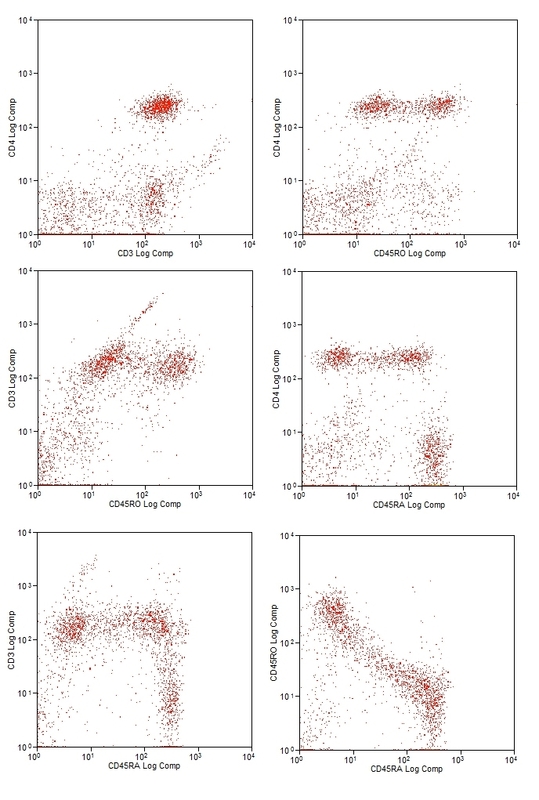 Four-Color Human CD45RA/CD45RO/CD3/CD4 Flow Kit can be used for single-step identification of human helper/inducer naïve (CD3+CD4+CD45RA+) and helper/inducer memory (CD3+CD4+CD45RO+) T-cell subsets. CD3 is a member of the immunoglobulin superfamily, which acts as a mediator of signal transduction, through association with the α/β or γ/δ T-cell receptor (TCR). Mammalian CD3 is a multimeric protein composed of four distinct polypeptide chains (ε, γ, δ, ζ), consisting of two heterodimers (εγ, εδ) and one homodimer (ζζ). CD3 is expressed by a high-percentage of circulating peripheral T-cells and is considered a pan T-cell marker. Clone UCHT1 specifically recognizes the ~20 kDa CD3ε chain. CD4 is a single chain transmembrane glycoprotein and member of the immunoglobulin superfamily, which interacts directly with class II molecules of the major histocompatibility complex (MHCII), and is the primary receptor for the human immunodeficiency virus (HIV). CD4 is expressed by the helper/inducer (CD3+CD4+) T-cell subset, the majority of thymocytes, and at low levels by monocytes and tissue macrophages. The CD4 lymphocyte count provides an excellent indication of immune system health. Clone RPA-T4 binds to the D1 domain (CDR1 and CDR3 epitopes) of the CD4 antigen. CD45RA is an isoform of CD45, a member of the protein tyrosine phosphatase family, otherwise known as leucocyte common antigen (LCA), which acts as a positive regulator of T-cell co-activation, and is essential for the activation of T-cells through the antigen receptor. CD45RA is expressed by naïve T-cells, but not by activated and memory T-cells. Consequently, clone F8-11-13 can be used to distinguish between these cell populations. CD45RO is the low molecular weight isoform (~180 kDa) of CD45, the leucocyte common antigen (LCA). CD45RO is expressed by approximately 40% of resting peripheral blood T-cells, the majority of activated and memory T-cells and most thymocytes. It is also expressed on macrophages, monocytes and granulocytes. In combination with clone F8-11-13, clone UCHL1 can be used to discern naïve and memory T-cells. Four color combination consisting of FITC, RPE, RPE-Cy5.5 and APC conjugated monoclonal antibodies mixed in optimal ratio - lyophilised. Prior to reconstitution store at +4oC. After reconstitution store at +4oC. All you need to know about immune cells, lineage, marker expression and the marker protein itself. Providing a direct link to antibodies available to your chosen marker.